A Bill of Sale is a written legal document that facilitates a transfer of ownership of goods or property from one person to another. It serves as legal evidence through the written transaction that the seller has transferred all the rights of the particular asset to the buyer. A Bill of Sale doesn’t necessarily have to be written in complex form and can be quite easy to make. 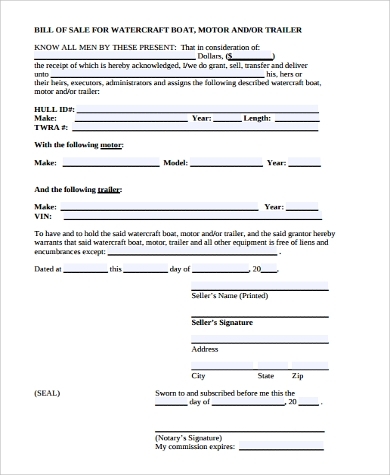 Here are a couple Bill Of Sale Samples that can be used as templates with forms that outline the details. They can be generic or particular and unique with a few minor alterations you may make. 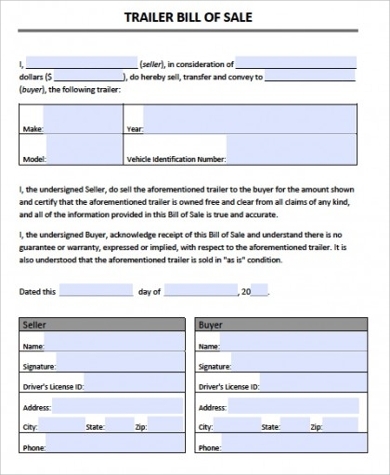 Format for selling/swapping of vehicles of equal value, as long as both are satisfied with the transaction. 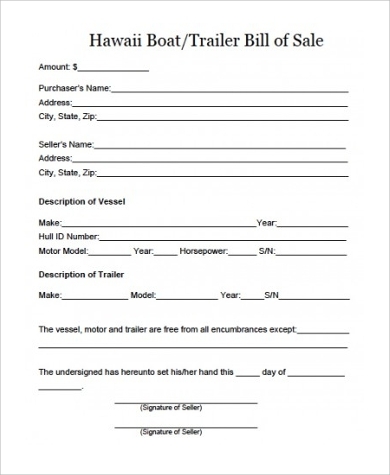 Includes all kinds of motor vehicles including boats and trailers in one convenient format. Some Even-Trade forms require “EV” codes in tax detail spaces provided and our form format can easily be edited for any tax value requirement. 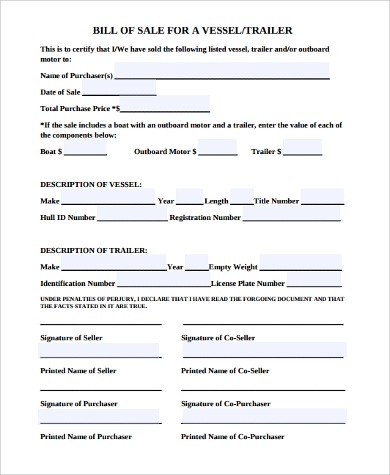 Includes complete details of vessel/trailer make, serial numbers for hulls, engines and outboard motors. Signature lines for both parties concerned including co-sellers are included. 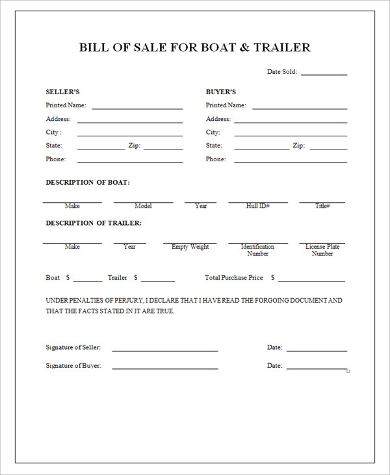 Bill of Sale form for non-motorized, towed RV that’s sold in “as is” condition with with all the corresponding details in spaces provided that’s standardized for use without the need for too many alterations. 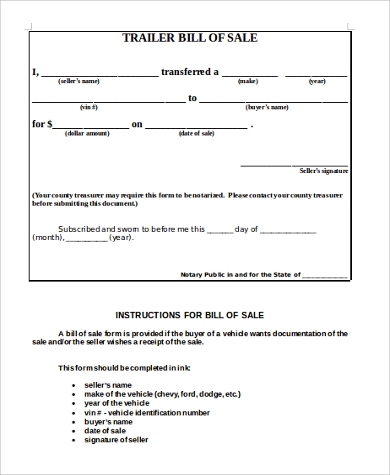 Our complete list of Bill of Sale Examples, including forms that are specific to some state laws on motor vehicle sale requirements, can be found here in downloadable forms for both Microsoft Word DOC and Portable Document Format (PDF). 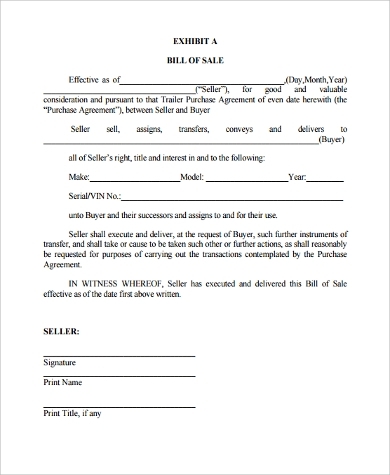 Please note that a Bill of Sale form is not considered an official document to prove ownership, but made as a recorded document of transaction for both parties to keep for their benefit. A separate title transfer is needed as proof of ownership. 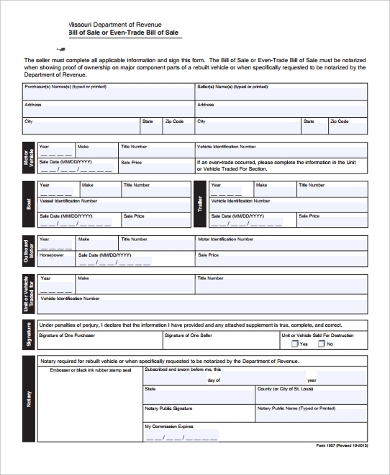 Here are a few more samples of Motor Vehicle Bill of Sale forms available for download. As final reminder for both parties, it may be important that the Bill of Sale be notarized to ensure that the document is legal and the signatures that appear in the document are authentic. For the seller, it’s doubly important that you keep a copy of the Bill of Sale as proof that you sold the vehicle and is no longer responsible for it, in an event that the new owner may be apprehended on a traffic violation or in an event of an accident involving the vehicle.